Recruiters may think that this is the golden age of recruiting tools with new services cropping up promising AI this or AI that. But actually the pickings and the quality are rather anemic when compared to the quality/quantity of sales/lead generation tools available. Recruiting is similar to lead generation/sales: Find the right prospects and convince them to do something. Sure, there are differences between the two. 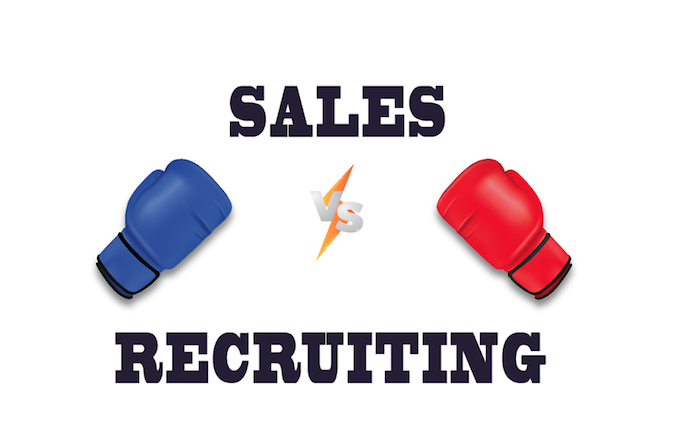 Recruiters are looking for one person per role while Sales tries to sell to as many buyers as possible. But overall there are enough similarities to compare sales tools to recruiting tools. The Sales departments, along with Engineering, are the darlings at most companies since Sales are viewed as the money maker. HR/recruiting, on the other hand, is considered a cost center and sometimes treated like a red headed step child. This is completely unfair as talent is the main competitive advantage for any company. Yet Sales gets the bigger budget and no one will say no to them on purchasing services/software when they argue that it would help to increase revenue. Not the same with Recruiting where everything has to be justified. This partially explains why Sales reps have sophisticated tools while recruiters are still using Social Media. While the revenue is easy to measure, the cost of bad hire or a delayed/no hire is much more difficult. So it’s easier for Sales to argue to buy a $10K service if can help them get $20K of revenue. Recruiters could make a similar argument about increasing hiring by showing lost productivity due to slow/no or bad hiring to justify budget or corporate support. Why aren’t sales reps using LinkedIn? Because they have better options. LinkedIn is a “business” networking site right? You would think that LinkedIn is a great tool for lead gen with millions of decision makers on it. But 2/3 of LinkedIn’s revenue is from talent solution vs 7% from Sales Navigator. And of those 7%, some of that is from recruiters who have opted to use Sales Navigator instead of Recruiter Lite. Sales/marketing people would rather slash their wrist than pay $4-10 every time they contact a prospect. This is what recruiters are doing on LinkedIn. What is worse is that once recruiters are used to paying that price, they will continue to do it. Hence a few other recruiting platforms have pegged their pricing to LinkedIn’s. Sure you paying a little with these platforms less but the “anchoring” affect is already there. If you are already paying $4-10, then $3 doesn’t seem so bad. The amount of information that sales get from lead gen servicers are staggering. They are informed of everything from who just quit/got hired, budget of the decision maker, technology stack used by the company, org charts, and any pierce of information that could be valuable in prospecting. Sales prospecting tools are prescriptive with prospect buying triggers, suggested ideal prospects, news alert, and other predictive analytics to guide sales rep on who and when to contact. Recruiters get LinkedIn Open Candidates which has almost zero adoption and are used by people actively looking and not passive candidates. Let’s look at some of the reasons why sales tools are superior to recruiting tools. There are no 800 pound gorillas in lead generation and this helps to promote innovation. With recruiting, most organizations are using LinkedIn and are restricted by budget (since many recruiting tools peg their fees to LinkedIn and thus are prohibitive) or IT may not be supportive of multiple tools. In this capacity, LinkedIn acts like a monopoly and directly or indirectly prevents innovation in recruiting tools. Lead gen tools have been around much longer and are much more utilized than recruiting tools and thus are more evolved. Sales are likely to fire tools quickly that don’t help them close deals. Sales reps can get fired quickly if they do not perform and are under the gun to find tools that help them to perform. Thus weak sales tools have died off already. Additionally, with bigger budget, IT support, and carte blanche to try anything, Sales is free to use multiple tools at once and adopt the ones that work for them. So they can try so many tools, they have a higher likelihood of finding a tool that fits their particular needs. We are not advising recruiters to go use sales tools although some of them could do either jobs well (Full Contact, Clearbit, etc). What we are advocating is for recruiters to be aware of comparable tools in Enterprise that are similar to recruiting yet offer more functionality or cost performance. Finding qualified candidates quickly would ultimately benefit the economy and our whole society. This benefit is too important to be denied due to a dominant incumbent recruiting tool preventing reasonable alternative options.